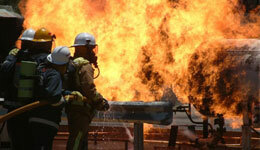 A gas explosion more often than not is the result of negligence by an individual or a company. A gas explosion, whether a natural gas explosion or propane (LP gas) explosion, is due to a gas leak of some kind combined with an ignition spark. The negligent act could cause the leak, or the spark. Gas tanks, valves and pipelines are supposed to be leak-proof; so if a gas leak leads to an explosion, it is highly likely that there has been negligence somewhere. The negligent act could have occurred in the design, manufacture, installation, inspection, improper repair or maintenance. The explosion injury lawyers at Cunningham Law Firm have a great deal of experience handling gas explosion cases nationwide. We have a number of local and national gas safety experts at our disposal who use their gas explosion expertise to ascertain the cause, origin of the gas leak, as well as applicable codes and standards. We have handled many heart wrenching cases involving individuals badly burned in propane or natural gas explosions. Our team will do all they can to help our clients and their families get through what is a terrible ordeal. We have handled numerous gas explosion cases involving propane, natural gas systems, automobiles, gas stoves, and propane containers. We have assembled the best experts and propane gas explosion layers in the United States to assist with the preparation of these cases. We specialize in handling these type of cases and have obtained some of the largest verdicts and settlements in the country. Residential propane gas explosions, natural gas explosions, and house fires cause a number of catastrophic injuries, serious burns, significant property damage and wrongful deaths every year throughout the United States. The Cunningham Law Firm has handled some of the most significant gas explosion cases in Arizona and across the country. We handle gas explosion (natural gas, propane gas explosion) cases throughout the United States and our lawyers work on a contingency fee basis; if we don’t win your case, you don’t owe us any fees. Call Cunningham Law Firm at 602-257-1750, or complete our contact form to arrange a free consultation. Se habla Español.